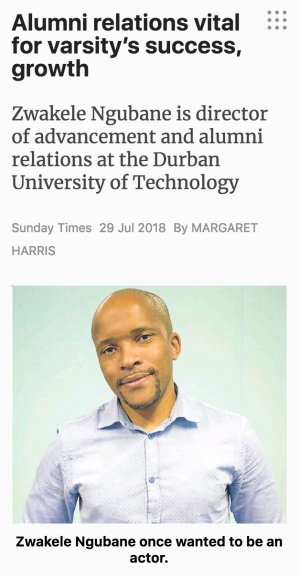 Zwakele Ngubane is director of advancement and alumni relations at the Durban University of Technology. He was interviewed by Business Times Careers about his work. Why does DUT need to maintain contact with former students? We believe in building and maintaining long term relationships with our graduates, in line with a holistic approach pioneered in South Africa by Inyathelo, the South African Institute for Advancement. Relationship building is one of 10 advancement elements that enable us to work in an integrated way to attract financial re sources for DUT's long term sustainability. Alumni constitute a key stakeholder group for the university as they have a vested inter est in its continued success and growth. Raising funds for the university must be challenging, especially as most people are under pressure. What are some of the stressors in your job? I have many stressors related to my job, but the key stressor is meeting our fundrais ing objectives because the projects that we raise funds for are important for the develop ment and growth of our students. If we don't deliver, it means students who could have been assisted with a bursary might not be able to continue with their studies. Another stressor is the lack of apprecia tion and understanding of what we do. This results, sometimes, in people expecting our office to come up with funds at the drop of a hat, not fully appreciating that there is a deli cate and lengthy process involved in raising funds.